And you do not have to suffer from it ANYMORE! for a NATURAL , SAFE yet EFFECTIVE treatment of arthritis. Welcome to the world of AYURVEDA! It's the best way to deal with 'ARTHRITIS'!! With about 70 million people in the U.S. afflicted with some type of arthritis, the search for effective treatments has grown over the past years. This is a very useful ebook, particularly for people who have not found relief from a variety of treatments. Read how Ayurveda looks at this problem of 'Arthritis' and treats it effectively. How healthy, flexible joints rely on digestion and metabolism. Primary cause of arthritis - like an excess of Ama ,lack of agni etc. Dr.Liana Purghel says that, "I've read the ebook today and i found it to be interesting and revealing. I myself am a physician and also practicing acupuncture. Life is indeed a mistery and it seems that with all of nowadays knowledge we still can't offer better treatments. Amazing is the fact that ancient civilizations held many of the answers and solutions which elude us. Thank you for the informations. It is a good book. Freedom from the inflammation, stiffness and pain of your arthritis? The ability to be able to do the things you WANT to do when you want to do them? Whether it is to simply take a walk in the morning or to go dancing with your spouse. The ability to enjoy your favorite past-times, whether they be sewing, golfing or playing tennis? Just the simple act of opening a jar or tying your shoes without any pain can be yours! The information about how you can STOP arthritis at the root of the problem, instead of just masking the symptoms? Freedom from the daily grind of popping prescription pills, their side effects, and over-the-counter products? If so... This Will Be the Most Important ebook You Will EVER Read! P.S. - Learn more about arthritis pain relief and make work easier, make life easier. P.P.S. - Avoid embarrassment and restore your self-image. Regain your self-respect and improved health. Simply click here Now! 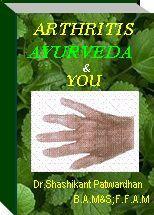 "The Most Complete Guide for Self-help and self-improvement in Arthritis problem. I have been immensely benefited by this ebook." wrote the following " I am a Nurse and a Physiotherapist and I have been trained in the basic concept of Ayurveda 20 years ago in Argentina.I found the ebook very interesting and easy reading with enough information to make the learning effective. You have the ability to put complex concepts in simple words. " The Ebook on arthritis is very helpful to understand the disease. The first step to take is to improve the digestion and get rid of toxins. I will gradually add to my routine the advice in the Ebook. This is very useful ebook. I have used some of the remedies and I am pleased with the results. Thanks for your wonderful and informative ebook. It really helped me a lot. I found this material incredibly helpful. I thought the discussion of arthritis, causes, pathogenesis was very in-depth and cleared up many questions I had on how it develops and how to stop the progression of this disease. I also thought the general overview of Ayurveda was quite good even though i am an Ayurvedic practitioner and am familiar with the concepts. I want to read everything by this author now!! Thanks! RHEUMATOID ARTHRITIS OR "AMA VATA"